Among the big lessons the U.S. election of 2016 taught the world, it's that Americans don't understand each other. Polls and pundits hadn't figured out what was under our noses all along: That we have been living in separate bubbles, with little or no experiential overlap. Within each bubble, one side is deemed ignorant, irrationally religious, or racist; while the "other side" is viewed as elitist, too soft, or morally lax. You know who you are - or who you aren't. When we fail to get to know those who look, dress, speak, cook, worship, work, have fun, see the world, spend money or consume media differently than ourselves, it's hard to build empathy for them. They become a statistic, a member of a confounding group, objectified. Our treatment of others is more likely to be informed by generalizations, not personal experience. Separateness even affects us neurologically, as parts of our brains fail to light up when someone we don't relate to suffers. The result might be apathy, as well as fear, anxiety and loneliness, just to name a few side effects. This isn't how I want to raise my children. Despite the antagonism, divisiveness, and greed that seems to dominate the headlines, I want them to grow up kind, caring, honest, generous and respectful of differences. It's good for them and for our world. Fortunately, solutions are not complicated. I've been researching the most effective means for thriving in a global economy and how to raise global citizens for almost two decades. Despite the complexity of the big picture, time and time again, the solution seems to lie in the little things: How we treat the cashier at the grocery store and the types of stories we choose to read at bedtime spill over into how we see the whole world. Since our children are watching us, these small gestures become their model of behavior, shaping our kids' wider social environments. Indeed, a pro-social, empathy-rich environment doesn't just feel safer to be in, it's been shown to enhance children's cognitive ability. With years of exposure to acts of kindness and images of diversity, the ability to think creatively, communicate more effectively, analyze, and empathize beyond a limited bubble is enhanced significantly. This is how "soft" skills become the sought-after skills of 21st-Century learning and global problem solving. Approaches for stepping outside our bubbles might be as diverse as a family's daily routine, so I offer these ideas as a simple beginning. Start with stories. The fact that a great story can transport us to a new adventure or a far-off locale points to the power of stories for breaking out of our shell. President Obama recently told the New York Times: "At a time when so much of our politics is trying to manage this clash of cultures brought about by globalization and technology and migration, the role of stories to unify -- as opposed to divide, to engage rather than to marginalize -- is more important than ever." For Multicultural Children's Book Day, Black History Month or any day, make a conscious effort to choose stories to read or listen to as a family that start with a perspective that might differ from yours. Consider posting a world map on a wall, or keep a quality World Atlas handy, and mark all the places you've read stories from. Conscious of the travels of your imagination, you might not only stretch your curiosity, but also your geography. Gain a sense of being part of the larger human family. It's difficult to imagine beyond our confines if we never think about it or "see" what it looks like. 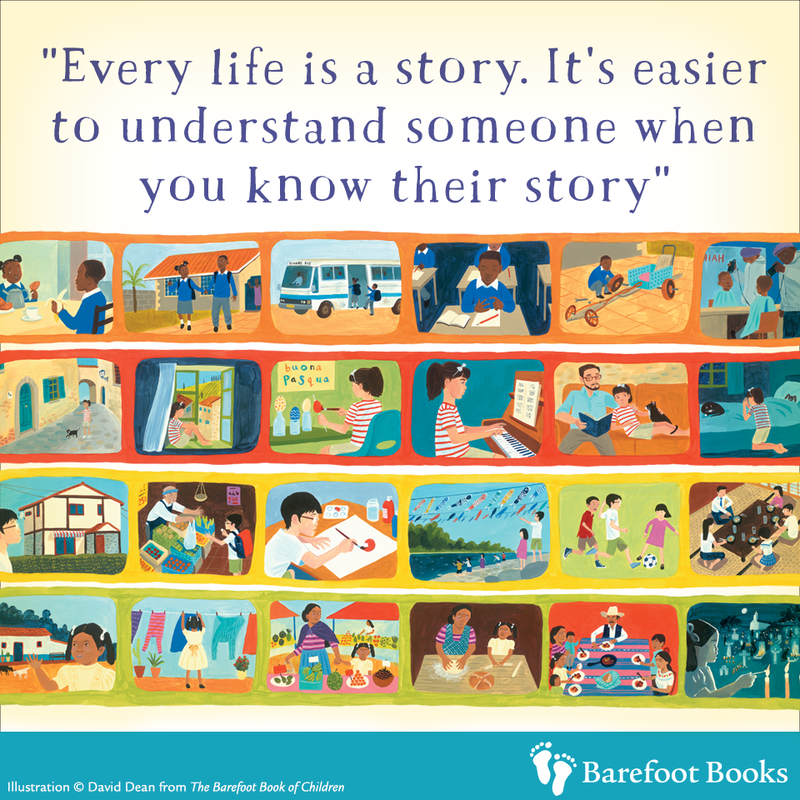 Family-friendly films from around the world, as well as picture books showcasing the diverse lives of children from classic Children Just Like Me to my new favorite, The Barefoot Book of Children, allow readers of any age to step inside the homes, foods, games and interests of children around the world. Vivid images help create connections and light up that region of the brain that triggers empathy for others. Gently peek into the practices and teachings of diverse faiths. As I've discussed elsewhere, you don't need to attend a long or unfamiliar religious service to start to appreciate a different faith. Visit an art museum with collections inspired by those traditions. Listen to their music or chanting. Read short passages of their sacred texts. Learn perspectives of various parents through blogs or ideally, in person, informally. Read children's stories like Prince of Fire: The Story of Diwali, Golden Domes and Silver Lanterns, and many others for a gentle introduction. Enrich libraries near or far. 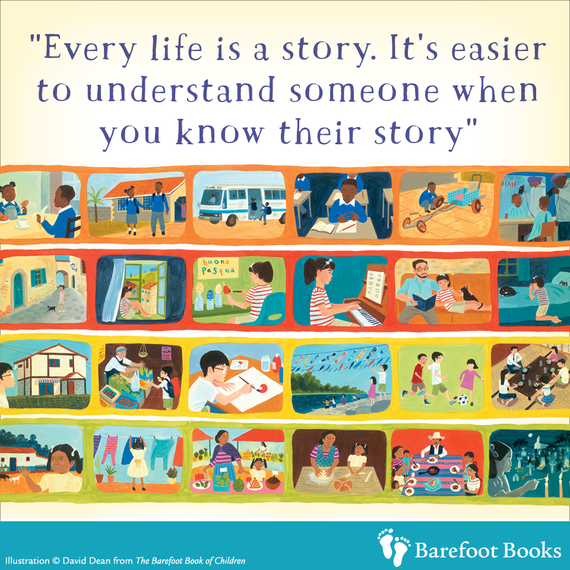 When my friend Maggie saw The Barefoot Book of Children for the first time she decided to donate copies to area libraries around her rural hometown in central Pennsylvania, an area where few residents travel outside the United States or get exposure to global cultures. Reading a beautiful book shouldn't be just for privileged children, and it might have the power to start bursting some bubbles. Helping "seed" a school or public library with diverse and multicultural books is powerful; involving our children in the project can also get them excited about choosing titles to donate. Show moral courage/Be an upstander. With the rise in anxiety and tension within schools and public places since the 2016 U.S. election, there is a critical need to show moral courage, to stand up for those who may be targeted for their differences. How can we and our children have empathy for and stand up for those who might be different from ourselves? You might ask this at the dinner table or in morning meeting at school. This short video recounts what it might look like for an adult to use one's privilege in a daily experience. Good stories, like The Boy Who Grew Flowers, also can illuminate moral courage. This literature list for all grades includes additional helpful titles. As we embark on a journey of growing our understanding about diverse cultures and ways of thinking, we'll discover many more creative steps for breaking out of our bubbles, at any age. It's good for our kids and it's good for our world.